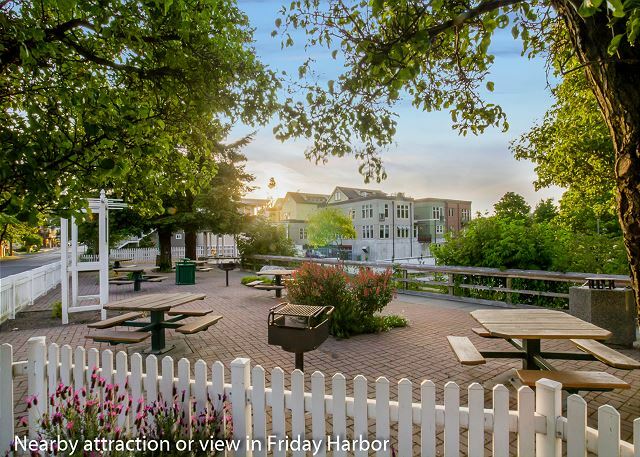 Conveniently located right above the ferry landing, Churchill Plaza is the ideal vacation rental for those that want to be in the heart of Friday Harbor. Relax in front of the propane fireplace while watching the boat traffic in the harbor from the living room of the Churchill Plaza #1. The kitchen, which is open to the living and dining area, is fully equipped with everything you need to prepare your meals. 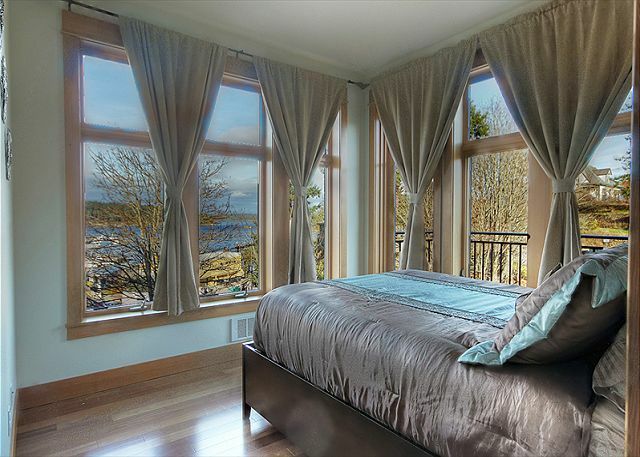 The master bedroom is furnished with a queen sized bed and offers harbor views. 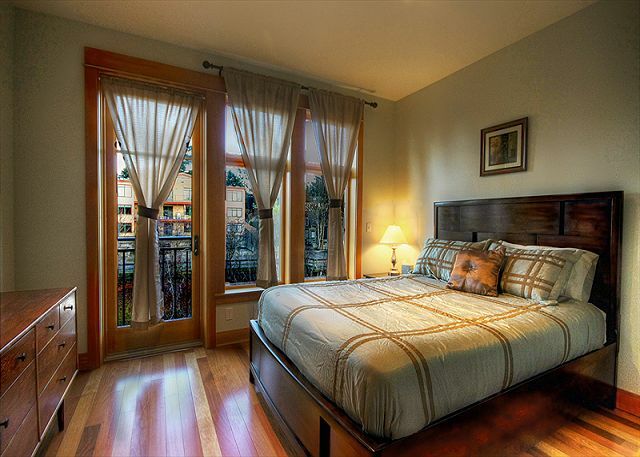 The guest bedroom is furnished with a queen sized bed and overlooks Sunken Park. 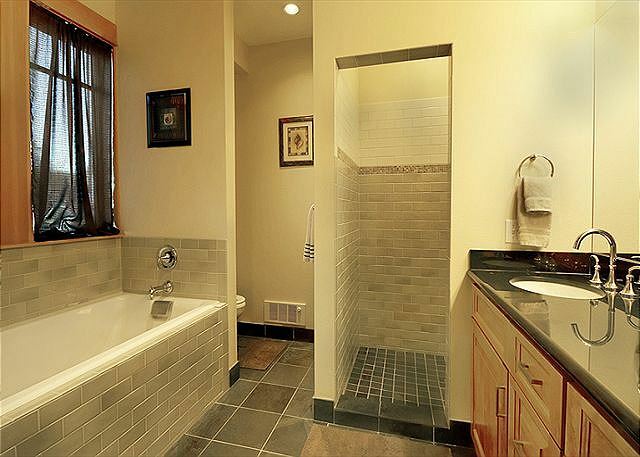 The master bath features a walk-in shower and a large soaking tub. 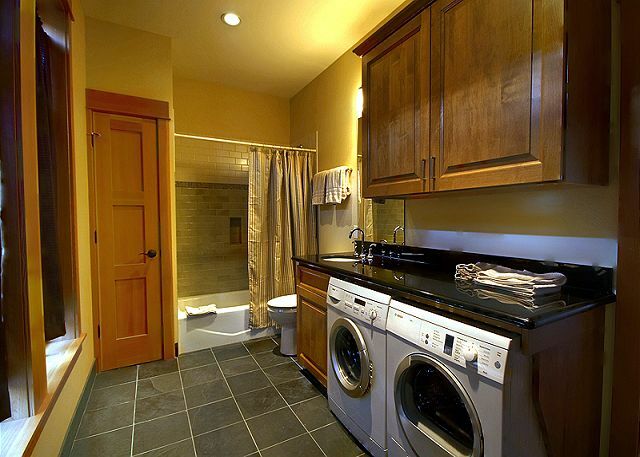 The second bath is also equipped with a washer and dryer. Sunken Park has complimentary BBQ's, picnic tables, basketball court, and kids play area. 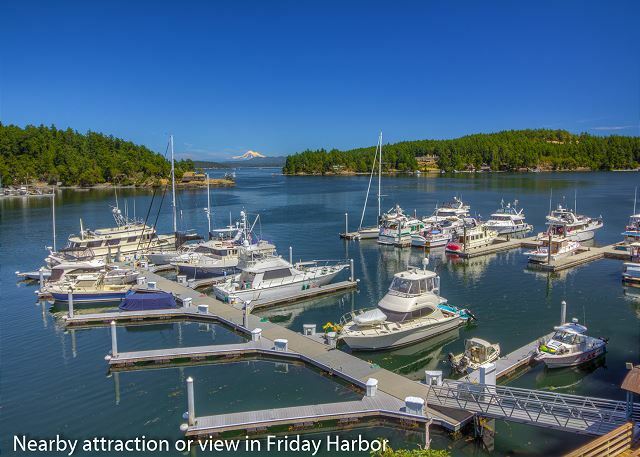 Churchill Plaza #1 - Centrally located in the heart of Friday Harbor, the Churchill Plaza offers all the luxuries of a private residence with beautiful views of the harbor and ferry landing. The property is in a mixed use residential and commercial building. The great room of the loft looks directly out to the water with a veranda and deck for outdoor enjoyment. In the evenings you can turn on the propane fireplace for a relaxing or romantic ambiance. The kitchen, which is finished with granite counter-tops and stainless appliances, also looks out to the water making it great for making meals and enjoying the town's natural surroundings and boating activity. The island kitchen also has extra bar seating. The loft offers two bedrooms and two bathrooms. The master bedroom is furnished with a queen size bed and looks out to the ferry and marina and has an adjoining master bath. The master bath is finished with granite counter-tops, dual sinks, soaking tub and tiled, over-sized shower. The second bedroom is also furnished with a queen size bed and looks out to a neighboring park where you can have a picnic lunch or play a little basketball. Located just above the ferry landing, the loft's location offers the convenience of not needing to bring a car with you. However, the property has a secure, private parking garage with an elevator. The Churchill Plaza is a great place to experience the island for a few days or a lifetime. Parking garage has a height limitation. Some full size trucks may not be able to fit (6ft 4inch MAX). There are street parking options of 2 hour, 8 hour and 72 hour. The condo was large, nice and comfortable, but the view was the best part. The large front windows and balcony looking out at the harbor were so relaxing. It’s close to shops and restaurants, too. We definitely plan to go back soon. 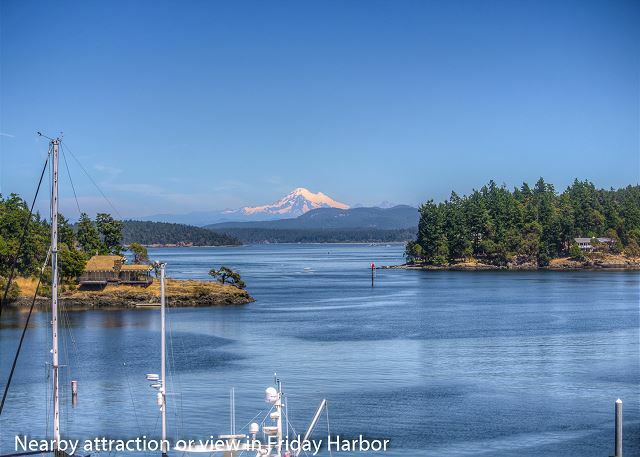 Churchill Plaza #1 does offer the best view of the Port of Friday Harbor! We are so glad you were able to relax and take in the view. 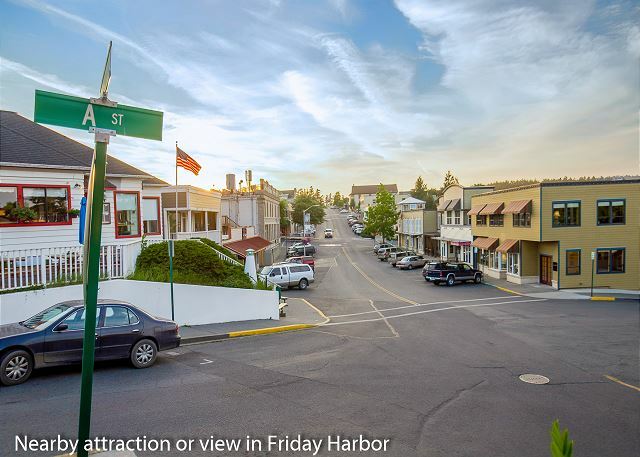 The proximity to the shops and restaurants of downtown Friday Harbor is very useful too! 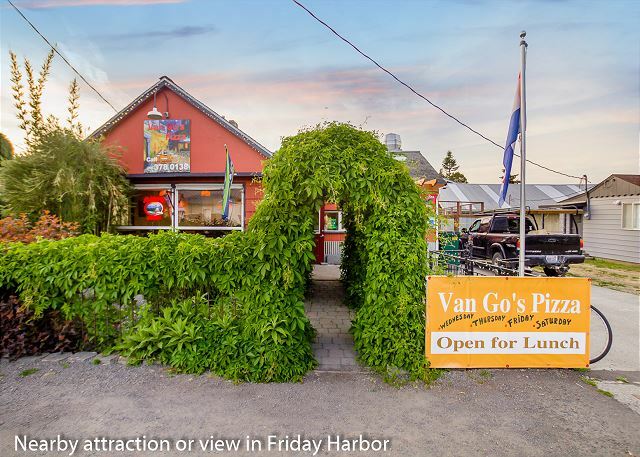 The location for this rental couldn’t be better - right near the ferry and easy walking distance to any restaurant and store in town. We were pleasantly surprised at the indoor space - larger than expected - though the bedrooms were a little on the small side. The entire place was very clean and well-maintained. The outdoor space would be very nice in the summertime. Overall, a freat experience. We are so glad your time at Churchill Plaza #1 was so pleasant. The close proximity to all the shops in town, as well as that water and ferry view is hard to beat! We'd love to host you in the summer season and have you enjoy the wide deck out front! This condo was the perfect location, views and amenities. We couldn’t have asked for a better place. In fact, on our drive back home, the discussion was coming back next year and staying longer. Use the condo as a hub and every other day visit one of the other islands. I hope we can secure for our next venture over when we have a better idea for dates. The condo was clean and comfortable. Great to have laundry capabilities as well. Kitchen set up well. Thank you for the opportunity to stay. See you again soon! The condo was great for a family and in an excellent location. We definitely plan to stay there again in the future. Note: A little attention could be used on the patio areas as they are beginning to have some green growth due to the damp weather. Overall very nice place though. Terrific location on San Juan Island close to ferry, good restaurants, grocery store and niceshops. For short stays on the island someone wouldn't need a vehicle as everything is within easy walking distance. Very nice property, amenities, and all well maintained. very large 2 bedroom condo with excellent view. everything was very clean and checkin/ checkout was a breeze. it's in a fairly vacant mixed business/ condo building which is a little odd but still recommend. Excellent! The property was beautiful, clean, comfortable and cozy. 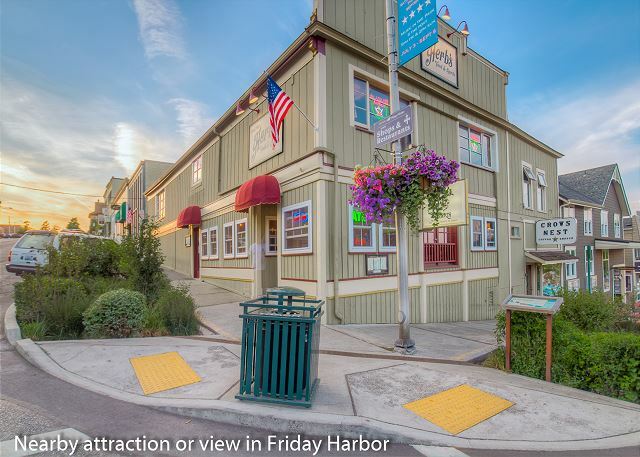 Perfect location for getting to the boats for whale watching and tons of excellent dining options within walking distance. Our island guests loved it! 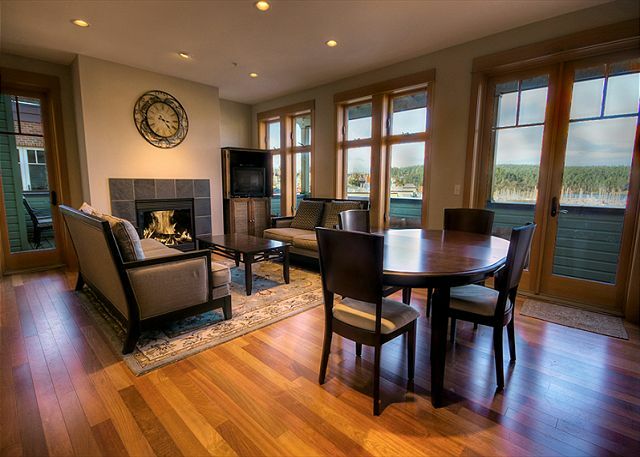 You walk in a feel the warmth from the beautiful wood floors and look out to a beautiful view of the Friday Harbor Marina. You can sit outside on the deck and have a morning coffee. We will send more people here in the future when visiting San Juan Island. 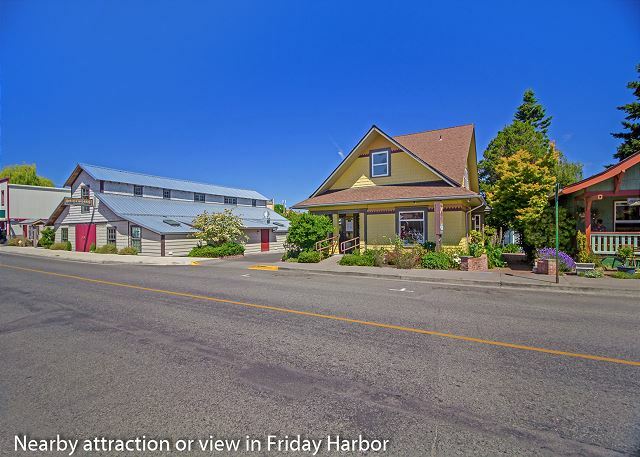 Clean, safe, comfortable, walking distance to all of Friday Harbor. Excellent location and views! So easy to get to the ferry and walk to other shops/restaurants in town. Very comfortable and well-cared for. 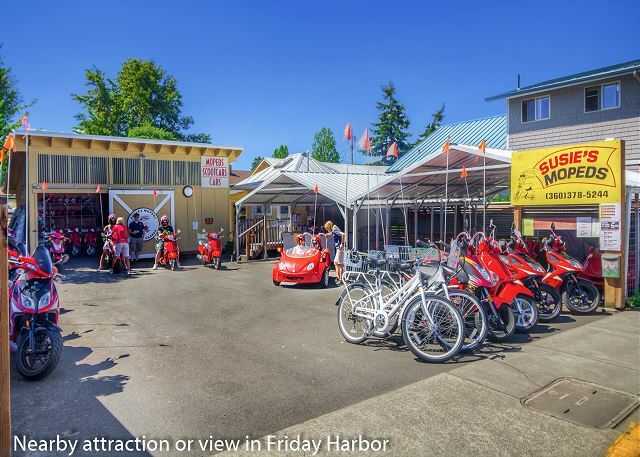 Perfect hub for our biking, whale watching and kayaking adventures! We had a terrific time. The condo is in a perfect location. Beautiful condo near the ferry dock, shops, and restaurants. Loved it and would recommend it to others. Great location and well kept apt. I found myself standing and just watching he world go by from the balcony on many occasions. The ferry waiting lot is right in front of this unit, but we didn’t mind at all. It is very quiet and well built. This was our second time staying here and we will be coming back next year as well. We had a great time, The place is located very close to the ferries. No need to drive, but we did because we wanted to see some of the rest of the island. There were 2 couples, we stayed in one night and cooked dinner, the kitchen was just a little lacking, but we made do. Need more wine glasses, and some form of BBQ would be great. But really no complaints! Great place, would stay there again! The condo was delightful. We loved being right downtown with a view of the docks. The property management company checked in right away to be sure that we had all we needed. Choosing this rental was by far one of our best decisions! The comfort, cleanliness, close proximity to everything, and view was perfect!! You can’t go wrong by choosing this property!! Very beautiful place. Great location to town. Could be noisey in season but I still would stay there. Directions to unit need improvement. Found unit but it was not well marked. This was a very nice 2 bedroom property. Great location and amenities. The Churchill #1 was awesome. If you are a person who likes to be in the action and energy of the town, this is your lucky day. Ferry landing right outside your window. Walk to restaurants, market and everything you could possibly want. Sit on the balcony, morning or night, and watch the world go by. Would rent again without hesitation. Everything wonderful about our stay. Management company very helpful and professional. Would stay here again. Many thanks. This was my first trip to the San Juan Islands with a group of friends and we would all happily stay at Churchill Plaza #1 again. The location is incredibly convenient and the view from the deck is stunning. It's right next to the harbor, with lots of places to eat, grab a drink outside, and eventually hop on the ferry home. The unit itself was extremely spacious and comfortable for our group of 4, not to mention spotless. The fireplace and two deck areas were lovely and the kitchen was well-equipped for cooking. The only thing to be aware of is that the proximity to the ferry means that you can sometimes hear the ferry announcements in the morning, however it wasn't a deal-breaker by any means. The property manager checked in proactively before the stay and the entire check in/out process was very smooth. We loved our trip and would absolutely stay here again! Will try come back. Very relaxing. Fabulous Location and lovely accommodations. We shared this condo with our dear friends. It was a very comfortable space for two couples. We didn't spend a lot of time in Friday Harbor as we were hiking on Orcas and kayaking. The condo is in a great spot to enjoy the town. Anything you need is walkable. Really clean, classy place. We will be going back for sure! This property was very clean and accommodating for our two nights there. We had some trouble with the ceiling lights and David was super fast at responding for us. The kitchen is fairly well-equipped and we had a nice meal. we like the fact that we could all sit comfortably in the living room and chat. it was a rainy weekend. So we stayed in for most of it although the shopping in Friday Harbor was just wonderful. The best view is from the bedroom, the front bedroom as the living room is somewhat obstructed by the wood railing. but it was a beautiful location, central to everything with nice furnishing and we would probably stay there again. It was a great stay for my sister and I. My vacation rental was fantastic. It is a beautiful place nd easy to get to anywhere from there! We LOVED our long weekend in Churchill 1 at Friday Harbor. This was an opportunity to really relax and unplug. But, there were plenty of things to do within walking distance and sites on the Island to interest us. San Juan Property Management was great to work with. When the smoke alarm was chirping on our arrival, we called and it was taken care of by the time we returned from dinner. And, the "thank you for your patience" gift from the chocolate & wine fairy was a nice surprise. Our stay in Churchill #1 couldn't have been more special. The condos was gorgeous, well equipped and had amazing views of the harbor. We truly enjoyed sitting out on the front deck listening to the sounds of the town and watching the ferry boats come and go. It was within walking distance to restaurants, shops, pubs, etc. It was nice to have a designated parking spot in the garage and the elevator made it easy to get our large, heavy bags upstairs. The beds were comfortable and it was nice to have plenty of linens and towels. We took advantage of the washer and dryer after being on a cruise the week before and needing to do some laundry. There are moped rentals nearby that we took advantage of and getting around the island is very easy whether driving or taking the moped. I would highly recommend going out to Roche Harbor. The food was exceptional at Madrona Bar and Grill. We ate there twice and the view are spectacular. I can't say enough about the condo and our experience on San Juan Island. Getting there from Anacortes on the ferry was super easy. It takes only an hour and the ferries run frequently. We ate fresh oysters that we shucked ourselves, saw whales off the West side of the island, and enjoyed walking on the beach. I can't say enough about the condo and the beauty of this island. The condo was beautiful! It was right at the harbor so there would be no need to bring a car. Everything was in walking distance. We had a wonderful time! We loved the condo. Great location and the condo itself was wonderful. It was clean, updated and with good room size. Our only critique was that the outside portion of the property was a little run down. Items like leaves not being cleaned up and lots of empty store fronts. Location, location, location & lovely condo. Great view, well equipped kitchen, beautifully decorated, lots of interesting places to walk right out the door, free protected parking was a bonus. Loved cooking and eating with the harbor view. We stayed in Churchill Plaza for a quick weekend getaway. Great location right next to the ferry. Walk to all shops and restaurants. Clean, beautiful condo. Loved it! In town, close to great restaurants and ferry landing. Easy to get to. 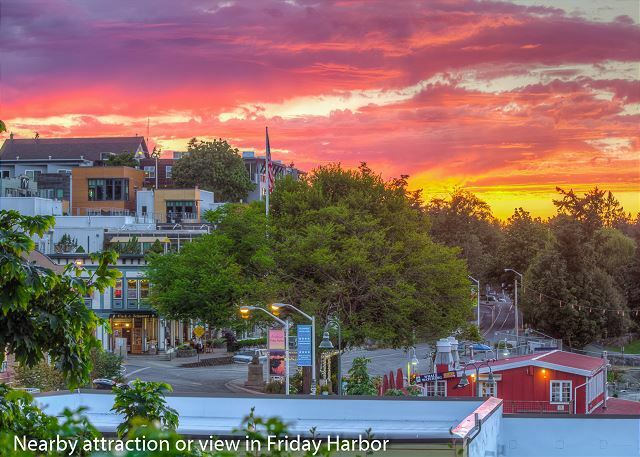 Great Time in Friday Harbor! 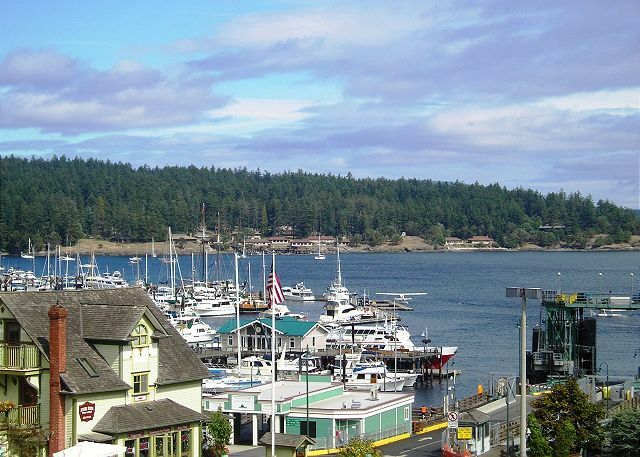 We thoroughly enjoyed our stay in Friday Harbor. The condo was well stocked with everything we needed and beautiful. We enjoyed using the decks for the views and the fireplace for the cool evenings. I cant think of anything I would change about the place. 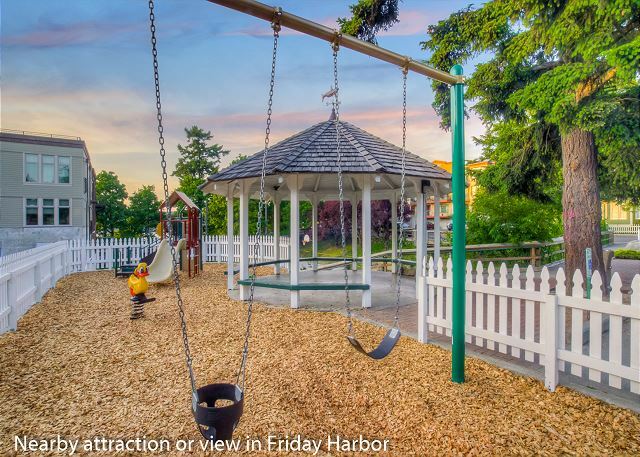 Great condo in Friday Harbor, within walking distance of shops, art museum, movie theater, and A Place to Play for children. Perfect for a relaxing getaway. The condo was everything we hoped it would be. We had a wonderful time exploring the town and the island and then coming "home" to comfortable accommodations. We hope to visit again soon. Decided to get away for the holiday this year to the Islands. Great location, nice unit. Bedrooms could use some storage (dresser, etc) and couches are not the most comfortable but overall the unit is great. 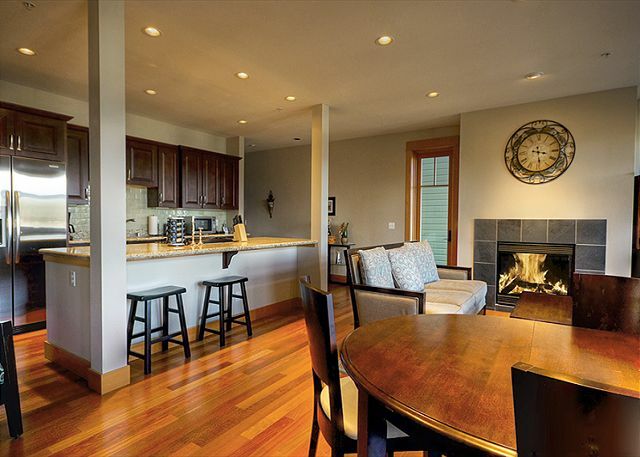 Comfortable, close to everything in Friday Harbor and right above the ferry. We enjoyed our stay at Friday Harbor and enjoyed looking out the window at cars lined up for the ferry. The town and restaurants were fun and driving around the island was interesting. The unit is very nice and clean. Cooking pans were not in good shape though. Overall, a fun experience. Churchill Plaza #1 was beautiful, comfortable, spacious. I had read the reviews about concerns about the noise in the mornings due to the ferry so we took earplugs to be on the safe side. Slept like a baby - no interruptions. Loved being right in the middle of town. We could all go out or stay in and rest as we needed/desired. Thanks for a great weekend. Absolutly wonderful, walked in and couldn't believe how clean and stylish it was. The view was to die for!! The kitchen.....can I just move in? Only thing I was disappointed in was the huge garden tub.....I wanted in that tub from the moment we got there, but there was not enough hot water to fill it. And even if there had been it runs so slow the water is cold before it fills up. Other than that it was PERFECT and I would come back again anytime. I absolutely enjoyed my stay at this rental. It is a prime location, has parking and a fantastic view. My only concern was that I had to pay a 100.00 cleaning fee on top of having to follow a lengthy cleaning list. We were very happy with everything about the place. Location is PERFECT, we were in walking distance of everything. Only issue we did have about location would have to be it is right off the ferry, so you will be hearing those noises, it didn't bother us enough to knock off a star. The place was very easy to find, it was clean and very cute. We were sad to leave it! Would recommend it to anyone. The stay was great, we really enjoyed the weekend. Couple of little things that I think you would like to know. The bedroom pillows are very worn and flat and probably need replacing. Very few teaspoons. The door in the master suite to the balcony will not lock. It will latch but not lock. Someone was parking in one of the two assigned parking spots, we only brought one car so it didn't matter to us but I could for your future guests. Also, might want to have a second garage door opener as guests may not always be coming and going together. With the exception of the pillows, none of these distracted from our stay they are just things I would like to know if it were my property. Thanks again for a great weekend. We loved the unit and the condition when we arrived. The person that answered question while making the reservation was very helpful in choosing the unit that would meet our needs. The noise that others complained about was not excessive - we felt we were part of the life of the community, with the park next door and the ferry arrival at 5:15 am. The only issue was fixing the building. The directions say 1st Street, but the sign on the corner says Harrison. Clarifying that would be helpful, but we know that now for when we will return. Also a plan of the layout in the listing would help clients make a decision. 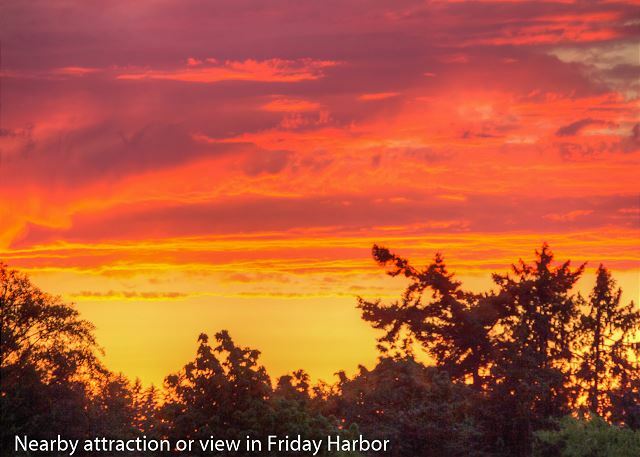 Thank you for being a part of a wonderful time in Friday Harbor. The property was very nice and the location great. We are repeating a stay at the condo next week. My only recommendations would be to add a second hair dryer to the 2nd bathroom and maybe a few more dishes for the kitchen. A place setting of 4 means extra washings and unnecessary running of the dishwasher. It would also have been nice to have a chest of drawers in the bedroom or at least bedside tables with drawers to unpack clothing for the stay. Very nice town, very nice views, the condo was very nice and all the comforts with everything provided,,,except the food of course. Highly recommended. Great location, terrific view, exceptional condo which all made for glorious memories. 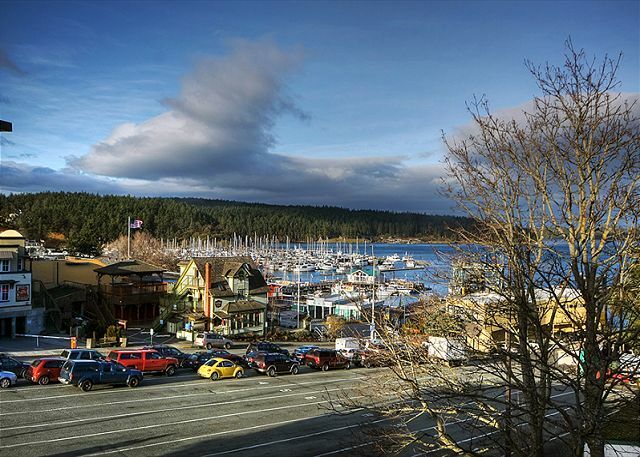 Great location in the center of Friday Harbor (right above the ferry parking lot--in the summer with the windows open you probably would get noise and fumes but it's perfect in winter). We have stayed here before so knew what we were getting but this time came with a seven month old. The apartment is safe for crawling infants but the heating system isn't the best--we could get the bedroom either cold or hot but it rarely stayed at the desired warm! You probably wouldn't notice this as adults but with an infant the temperature fluctuations were more noticeable. A few other quibbles: the master bedroom and bed are small (and the bed is ridiculously high--hard for me to get on it while holding a baby! ), there weren't many hand towels so we ended up using more bath towels than we needed, the master suite needs a drawer unit, and the drapes in both bedrooms barely cover the windows and are on such flimsy curtains rails you worry about pulling them off the wall every time you open and shut the curtains! In the spare room the curtain rail for the curtain covering the balcony door is spring loaded and sprung off every time we opened the curtains--very frustrating. It would also be great to have a kettle for boiling water. There was a smell of gas long after the gas ignited on the cooker--I'll contact the property managers about this. The property company were good-- everything happened as it was supposed to--but it all felt a little automated. It would have been nice to have more of a personal touch--a phone call during our stay to check all was okay or a follow up email after we left to see if everything was okay. We definitely had more of this when we stayed here before (I'm pretty sure we also got a welcome basket too). 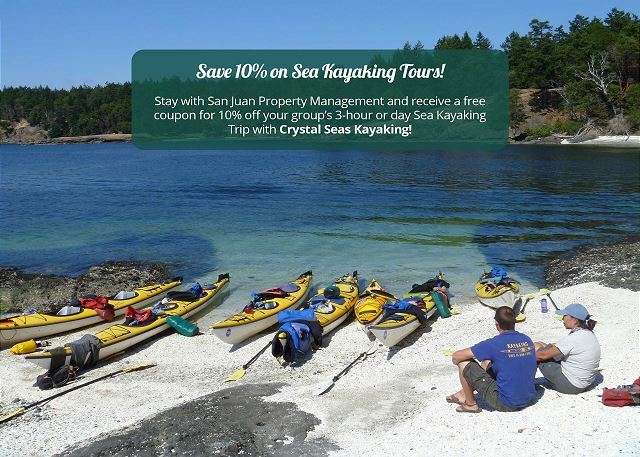 September is a great time to visittheSan Juan islands, we were able to bike ride, hike,sail and enjoy the beautiful views from the deck of our condo. Beautiful condo, great view and location. Could use more dresser space. Would rent again for sure! We stayed at Churchill for a girls weekend, it was a perfect place for us. The location was exactly what we had hoped for! We walked onto the ferry and the condo is right off the ferry, super convenient. We didn't need a car for the weekend. We walked to shops, rode bikes, exploring the town by foot was easy. Anywhere outside of town is easily accessible by an inexpensive taxi ride. The condo itself had two decks to take in the view. Beds were comfortable and the living space was an open floor plan for us to catch up and visit. Would stay there again. 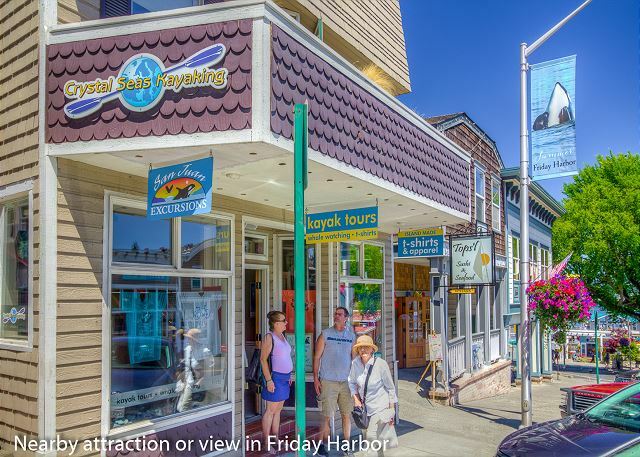 when visiting Friday Harbor. My three children and I really enjoyed staying here. The view is great, as advertised. The location was great - we could walk to everything we wanted, the bakery, grocery store, restaurants, the marina, etc. We had a car because we planned a whale watching trip with Captain Jim Maya (always recommended) and that was out of Snug Harbor. it's also nice to explore the beaches. Everything was very clean inside. The kitchen needs a new large non-stick frypan, and was great otherwise. The only reason for 4 stars instead of 5 on cleanliness was because the outside furniture (there are two outside areas) was a little dirty. Maybe because we were there in March and it was not expected to have the perfect sunny weather we had. You can't get a better view, a more convenient location or a nicer staff and the unit is pure luxury. This condo is well situated if you are travelling with out a car. It is just above the ferry terminal loading area. We walked our bikes onto the ferry each day and road on the other islands. The only negative is that there is some street noise, especially in the front bedroom. 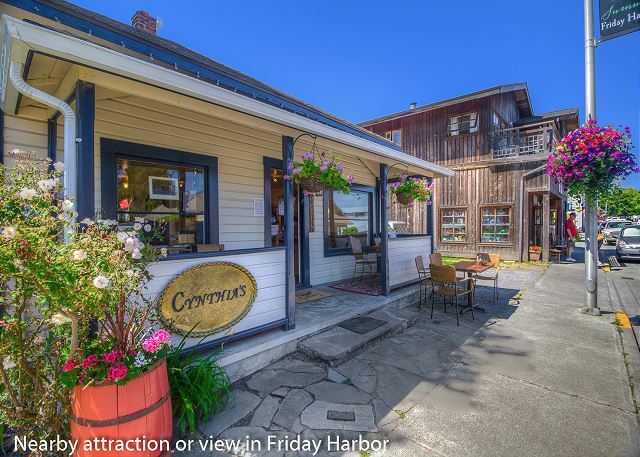 Great place in downtown Friday Harbor. We were extremely satisfied with our stay here. The location was great very close to a lot of wonderful restaurants and activities. 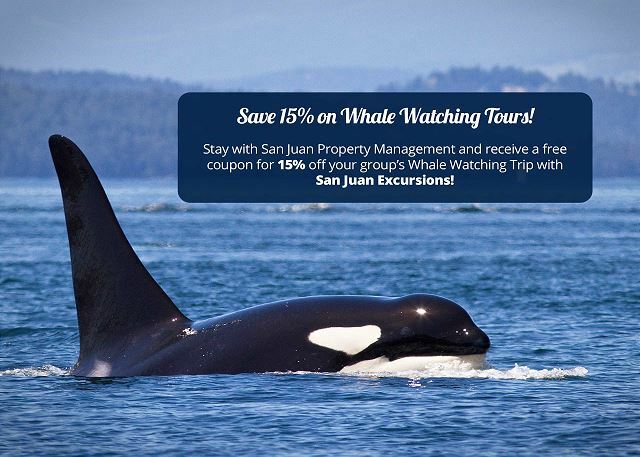 Hopefully we will have a chance to come back and visit San Juan Island again and we would definitely stay here and recommend it to our friends and family! Hop off the ferry and you're home! Great view (except when ferry traffic is lining up), in the center of all the action. Worried that the ferry traffic and noise would be a problem but it wasn't. Churchill #1 was well equipped except could have used a few serving platters and bowls, and a frying pan. Great overall experience. On the island for three days and could not found a better location. Close to everything, easy stroll. My four month stay at Churchill Plaza #1 was a first rate quality experience and one worth going back to in the future. The team at San Juan Property Management LLC was friendly and very attentive to my needs.